This entry was posted in CFL, Fan Experience, Game Day and tagged in fans, gameday. You’re assuming all players are giving it their all, every game. I don’t think that’s the case. Also, many are paid a decent chunk of change to perform. Our ticket supports that salary (a salary that, in many sports, is waaaaaaaaay higher than is should be). 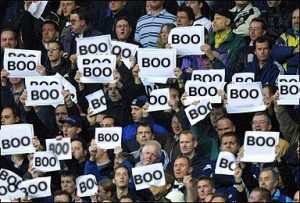 Booing is legit when the team is not giving the effort they should. Keep it clean though.